Issuing a marriage license on TV? Officiant Guy has done it many times, this time to Family Jewels’ stars Gene Simmons and Shannon Tweed. 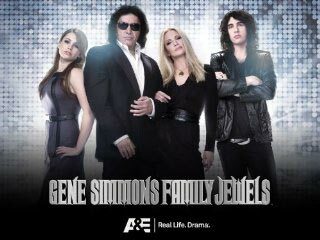 Officiant Guy on Family Jewels issuing a marriage license to Shannon Tweed and Gene Simmons. 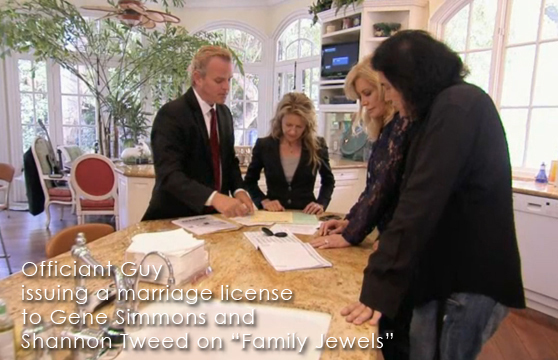 Chris Robinson, The Officiant Guy, was seen on the TV show “Family Jewels” wedding episode when Gene Simmons married Shannon Tweed. He was recommended to issue their Los Angeles marriage license since he is a marriage license expert and attorney. His wedding license service is the best and most reliable in California. Just ask the folks at the Los Angeles County Clerk’s office. If you would like the Officiant Guy to issue your marriage license anywhere in Southern California, then give him a call. Since the wedding license he delivers is a confidential marriage license he has couples flying from all over the United States (and the world) to issue the license and to officiate their wedding ceremonies so that they remained private and sealed from public view. Officiant Guy is the finest marriage minister in Orange County and Los Angeles County. Chris Robinson is an LA marriage ceremony officiant. He has been performing weddings and issuing wedding licenses for over 20 years. If you wish to get married in LA County or Orange County give the best minister for weddings in California a phone call at (310) 882-5039 or (562) 547-3255 or fill out the contact form.